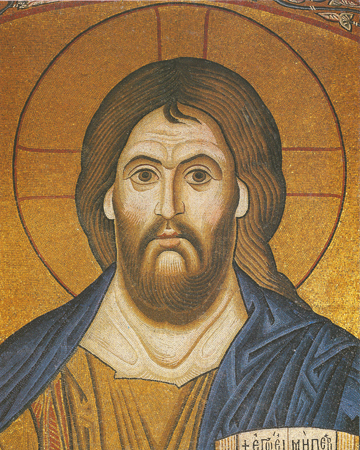 The term “Pantocrator” is from the Greek and means the “Ruler of All”. It is used to describe many icons of Christ, for the Lord is truly He Who rules all of the universe completely by His Providence so that all who desire to do evil have their wills modified in deed allowing only that which has passed through God’s hands and been made an opportunity for ultimate good (although this may seem mysterious at the time and with our short-term vision and understanding). In Heaven, God’s Will is completely manifest and brightly shines at all times. One earth, the Lord has asked us to pray that this might more fully come to pass, so that His ineffable and blessed goodness expressed in His Will, which only is truly good, not the pagan ideas of the mixture of good and evil, might always come to pass. This pagan mixture is expressed today often in the ideas of yin and yang in Chinese philosophy or in Jungian light and dark psychological imagery as a part of the “normal” psychology of man, and in the Hinduism pantheon of deities which includes Kali as the fearsome and blood-thirsty destroyer.